*the recipe I followed said 3 tablespoons but more brandy is better. If doing the cake quickly with limited feeding time I would go for 6 tablespoons. †Again I feel more spice is better. Mix all the fruit in a bowl and cover with brandy. Pre-heat the oven to 160°C (140°C fan). Cream the spread and sugar in an other mixing bowl. Add them slowly to the creamed spread and sugar mixing thoroughly. 1. Mix all the fruit together and soak in brandy. 2. Let it soak overnight. 3. Cream the spread and sugar together. 3. It will cream much faster than butter. 6. 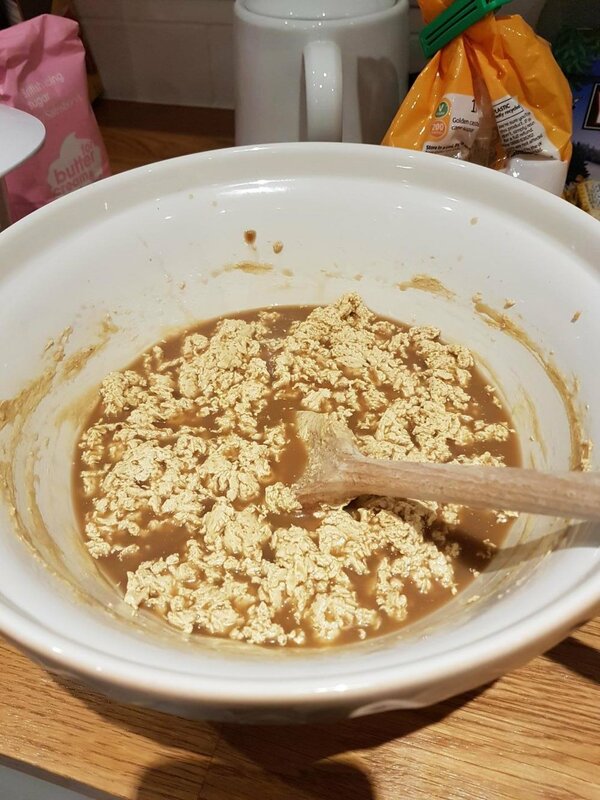 It will look a bit weird and curdled. Don't worry this is normal. 7. Use a sieve to mix the spice into the flour as you fold it in. 8. 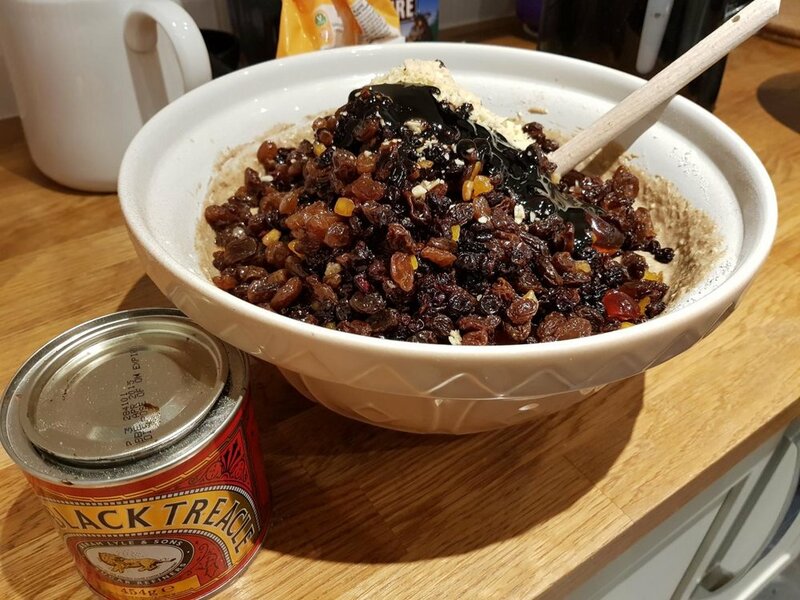 Add the fruit, treacle (and nuts). ‡Eggs normally provide the structure and help produce the foam structure of a sponge cake. 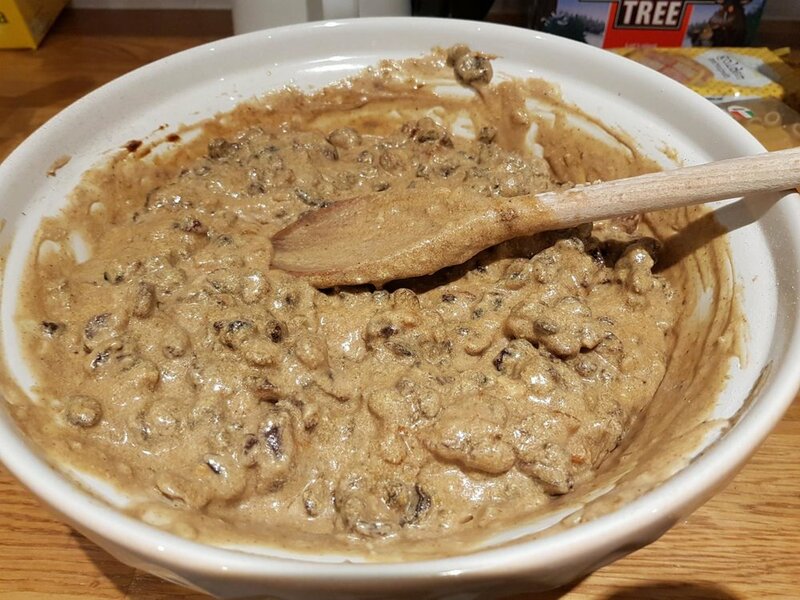 Whisking the oat milk helps get some air into the cake. 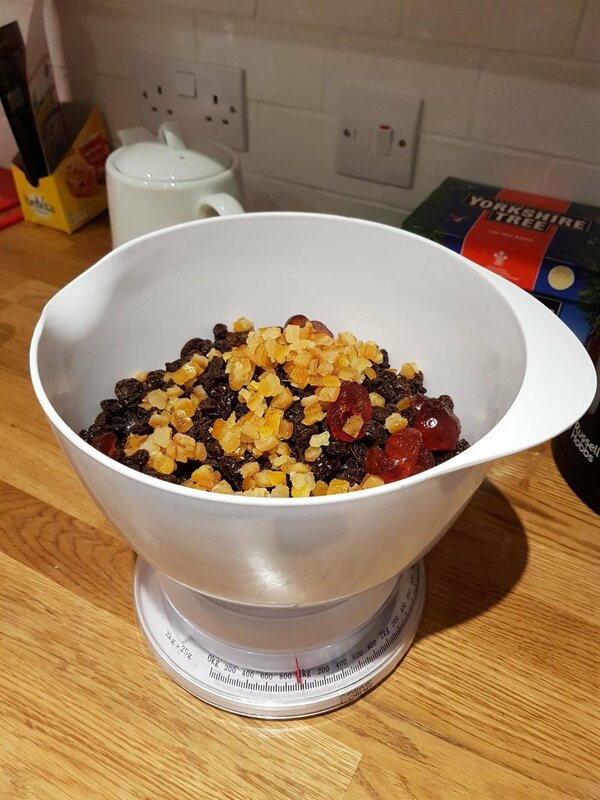 The benefit of a heavy fruit cake is that rising isn't a major concern. It is possible to make royal icing without eggs using one surprising ingredient: aquafaba. Or as most people will know it: the brine in beans/legumes are stored in. Use a pastry brush to spread apricot jam over the cake. Using rolling pin create a thin layer of marzipan and place it over the cake. 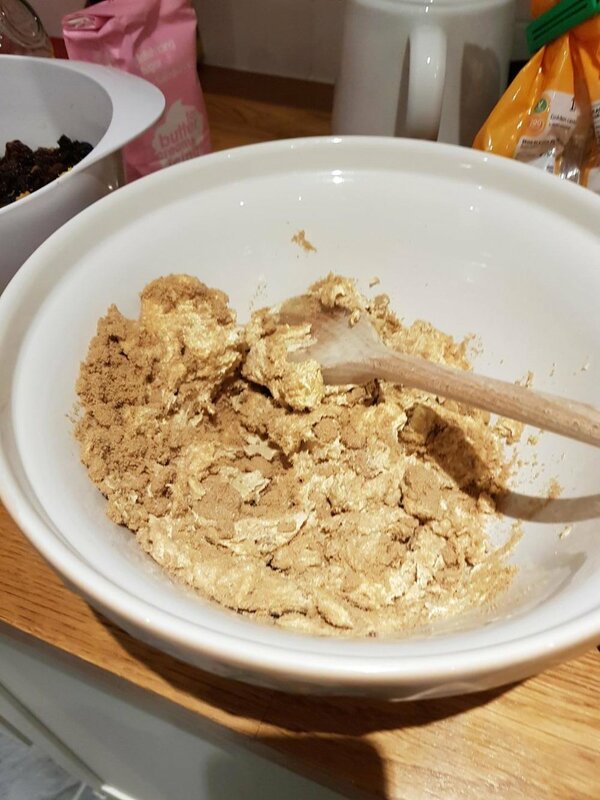 Clarify the aquafaba over a low heat by reducing it to 80% of it's original volume. Remove the froth and any other fibre. Add the aquafaba to the icing sugar and mix with an electric whisk. 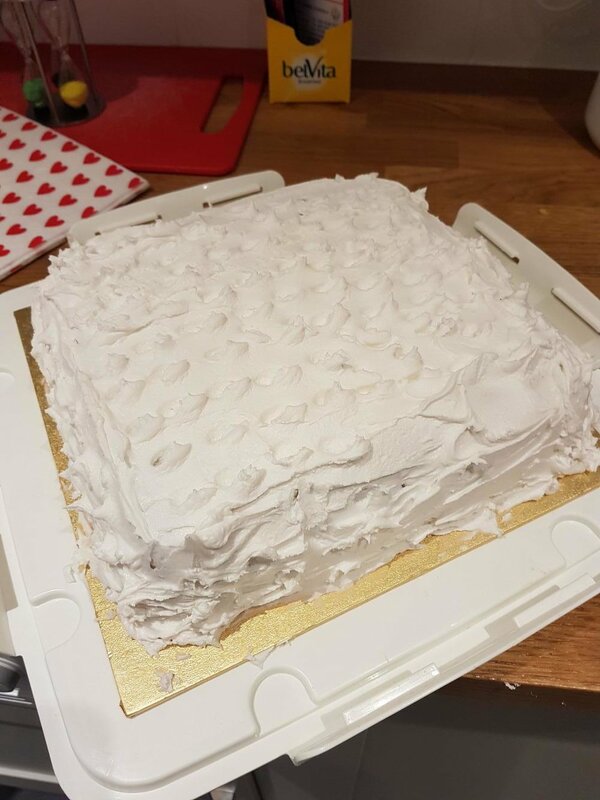 Once the icing is glossy it is ready to use. 1. Brush jam over the cake. 2. Put the rolled marzipan on the cake. 6. Whisk until stiff peaks start to to form and the icing appears glossy. 8. Spread the icing on the cake. 8. Smooth it off before making the snowscene. 9. Use a fork or knife to create small peaks for the snowscene. Smith, D., 1992. Delia’s Complete Cookery Course. London: Ebury Publishing.